It's been a good couple of days for writing and, as it turns out, for sweeping snow off my car. It's no polar vortex, mind you, but here at the bottom of the Rockies, a snowstorm comes as beautiful relief from the monotonous sunny days. I decided to paint my bedroom. And then I liked it so much, I decided to paint the living room. 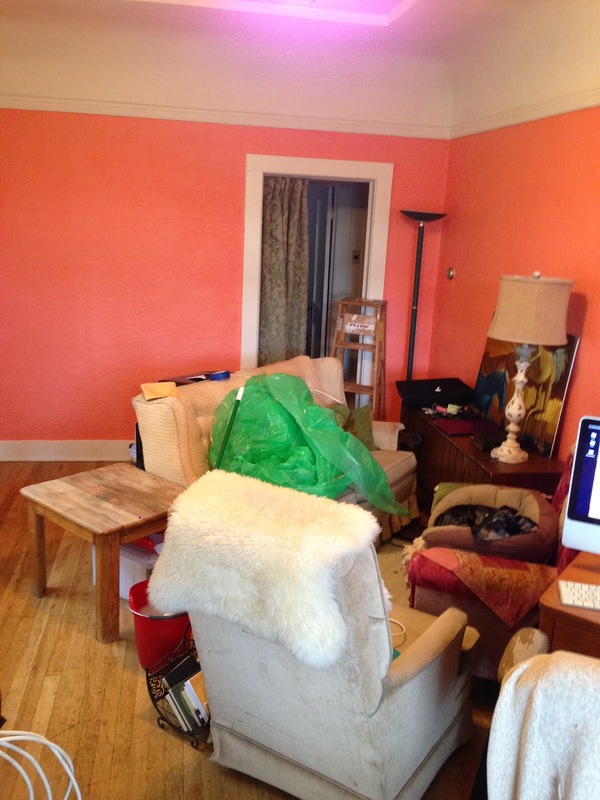 The color certainly brought warmth to the room, though had I known it would be more bubble gum pink than salmon, I might have put more thought into my color scheme. At least the yellow stained sofa is no longer the most eye-catching aspect. Painting two rooms with one arm and a hand roller reminds me that I'm still an over-achiever. In the beginning I thought nothing of it, but by the end of day two, my Michelangelo-like aspirations disappeared beneath the epsom salt water of a hot bath. Then, on Monday, I found myself in a particularly difficult position, aerially speaking, which required me to slide down the fabric, gripping it between my lower arm and bicep. The result was the loss of some skin and a nice rug burn on the inside of my elbow. I learned this about myself: I would rather suffer 2nd degree burns than ask for help. I am trying to be better to myself. I'm eating salads nearly every day, praying more, and forcing myself to journal. I'm reading a book by Kathleen Norris called Cloister Walk in which she says that in a monastic community "prayer rolls on, as daily as marriage and washing dishes." I like to think of prayer like that; mostly not lofty or high brow, but sometimes just like getting that last bit of spaghetti sauce off a plate, or painting a wall. Or something a little less hard on the arm. I prescribe more salt baths & asking for help! !